The Phillies took a 2 – 1 lead into the 8th inning against the Reds yesterday in their first game of the season. And then, the wheels fell off. Much criticism has been heaped onto the Phillies bullpen this offseason. While most of the team looks promising, this is going to be a sore spot. Of course, the rest of the team was not setting the world on fire, either. With only 6 hits in the game, including a 2-run Freddy Galvis homer, the Phillies offense was mostly silent. And the defense started off badly with a huge error from veteran Ryan Howard in the 1st inning which led to an early run for the Reds. Howard also did not have a hit in the game and left 3 men on base. 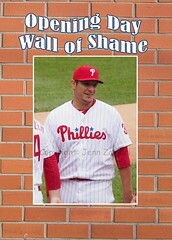 But while Howard should be elected to the Opening Day Wall of Shame, he was beat out by David Hernandez for the title. Hernandez allowed 3 runs in the 8th inning on a hit and 2 walks, sinking the Phillies ship for good. He did not record a single out. James Russell was not much better, allowing 2 more runs. In all, the bullpen 8th inning follies ended in a 6 – 2 win for the Reds. The real shame of this is that Jeremy Hellickson pitched a heck of a game. I am still not sure why he was pulled after only 6 innings and 70 pitches. Manager Pete Mackanin could have let him go one more inning and put Jeanmar Gomez in for the 8th inning. The 9th inning may still have been a mess, but at least with only 3 outs left, he would have had more wiggle room to mix and match pitchers. But that is only my humble opinion. The Phillies are off today and will try again on Wednesday; game time is 7:10pm and Aaron Nola will pitch.